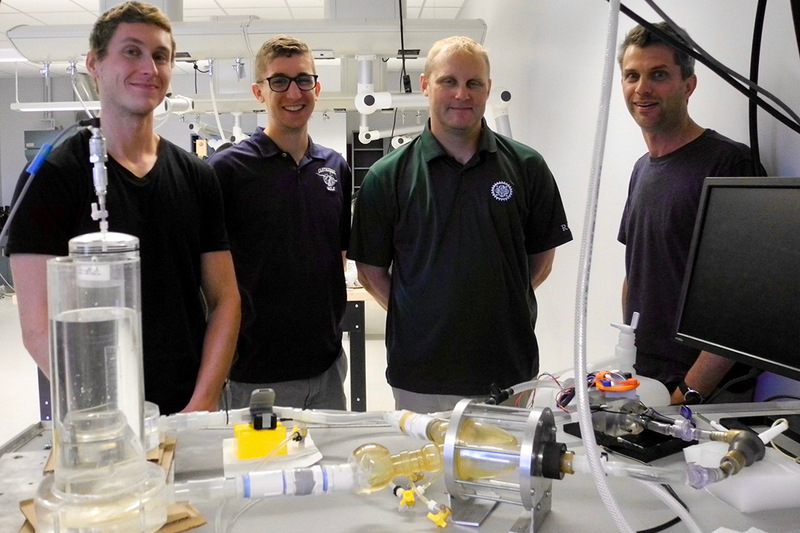 RIT members of the digital stethoscope development team are undergraduate mechanical engineering students Ian Prechtl and Steven Reuter, and faculty from the Kate Gleason College of Engineering, Jason Kolodziej and Steven Day. Stethoscope design has changed little since its invention in 1816 by Rene Laennec. Schwarz, director of the URMC’s Echocardiography Laboratory, performs routine imaging and advanced imaging studies on patients with complex cardiac disease and of patients with mechanical assist devices. The RIT and URMC researchers proposed modernizing a stethoscope design and worked to develop a prototype using innovative digital signal processing techniques, including digital signal filtering, advanced beat-based rejection algorithms and ensemble averaging. “It is almost unconscious, like people listening to engines, and hear something off that could mean a problem. But if you ask what sounds different, they may not be able to explain it or articulate it, but they just know. This is about getting the device to do that, to hear sounds and then to make that determination of what the problem could be,” said Day, a professor and head of RIT’s biomedical engineering program. He also has vast experience in the development of LVADs, building a state-of-the-art implantable blood pump with peers from the University of Virginia, the Utah Artificial Heart Institute and MedQuest Inc.